Life should be entertaining! I love creating, learning and entertaining others. This blog is a combination of the things I am trying and experiencing in my life and the people I am lucky enough to share it all with. We are somewhat infatuated with zombies at our house. So with the recent season of The Walking Dead starting, some friends invited us over to watch the premier. It only felt right to bring a zombie-related treat. 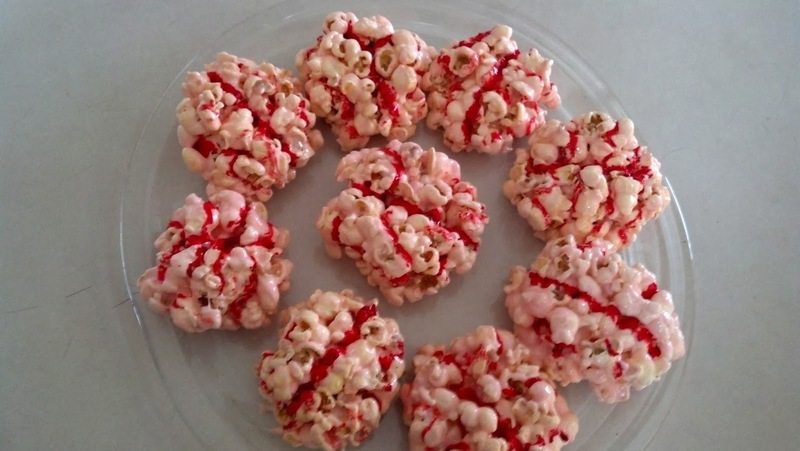 These popcorn brains were fairly easy to make (just a little messy) and they turned out pretty fun. This would be a great option to take to any Halloween party or potluck with relatively low cost and low time commitment. In large saucepan, melt the butter and marshmallows over med-low heat, stirring regularly. This process may take 5-10 minutes, but if you rush the marshmallow melting, your popcorn balls will turn out hard. Once melted, add vanilla and 2 drops of food coloring and stir until color is distributed. Stir in popcorn until evenly coated. Form popcorn into tennis ball sized balls. This is the part that can be kind of messy. I attempted to do this with my hands using some butter to grease my fingers, but the mixture was way too sticky and would not bind together but rather just stuck to my fingers. 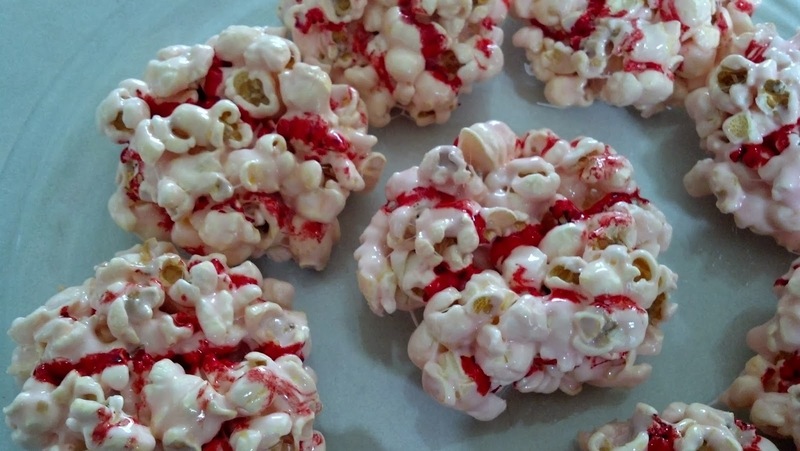 My solution was to take a square of wax paper, spray it with non-stick spray, spoon the popcorn into the center and use the wax paper to form around the popcorn ball. Then I carefully peeled back the wax paper to release the popcorn ball. You will want to form these into a somewhat flattened ball so they more resemble a brain shape. After forming a ball in the wax paper, I squished the ball slightly and pressed down along the center to create a minor valley between the brain hemispheres. This is the line where you will later paint your major dividing vein. Set the finished brains aside on another clean piece of wax paper to cool. After forming all the brains, use a paint brush and food coloring to paint the major vein down the middle of the brain and then as many side veins as you want for effect. Mmmmm....BRAINNNZZZZ!